Restringing a guitar is something all guitarist should strive to learn. New strings will nearly always make your guitar sound much better than old ones. The exception would be changing to a gauge or type unsuitable for your instrument. Putting classical nylon strings on a steel string guitar will not produce a suitable sound as the steel string guitar is braced internally much stronger than classical guitars. Doing the reverse will very likely damage the classical guitar as they are not designed to sustain the high tension of steel strings. If you are not sure of what strings you should use on your guitar, ask a sales rep at your local music store and be sure to inform him or her what type of guitar you have. The brand name of your guitar is not as important to the sales people as the type of instrument you have, type being classical, steel string acoustic, electric, folk, etc. The folk style guitar is probably the most confusing of them. 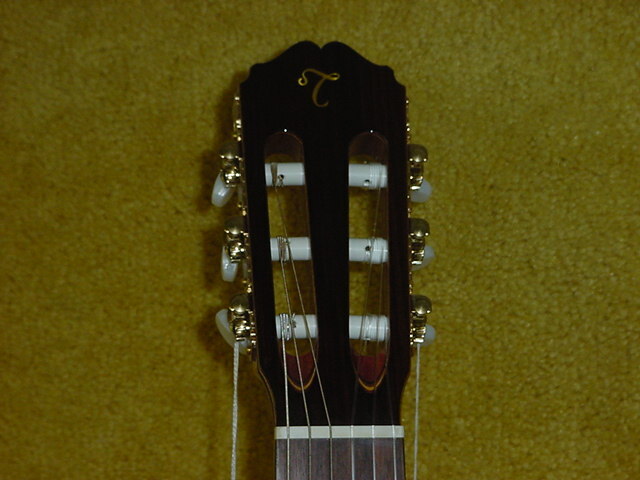 It will have a slotted head stock like a classical guitar, but bridge pins are used to anchor the string to the body instead of tying them on. 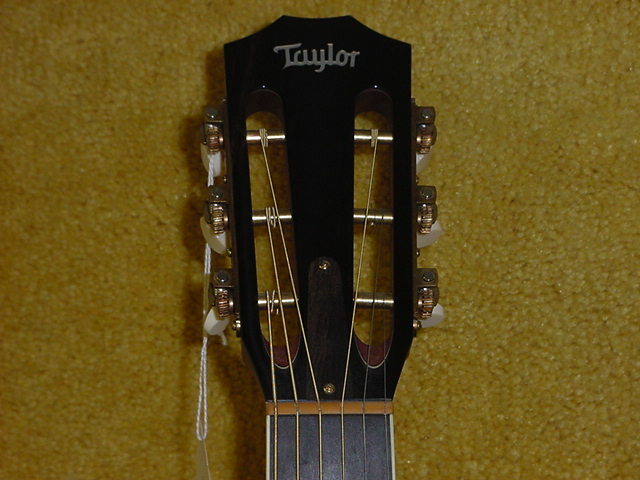 Folk guitars use the smaller all metal string shafts. You can probably get by using extra light gauge acoustic strings on a folk guitar, but I would recommend using silk and steel or silk and bronze strings. They have a smaller solid core wire inside the wound strings compared to regular acoustic strings and also have strands of nylon filament inside them. This construction creates less tension on the lighter constructed folk guitar. Classical guitars have no bridge pins and the strings must be tied on. Also the string shafts of classical guitars have large plastic sleeves over them. The guitar we will be re-stringing will be the common steel string acoustic with the string shafts protruding through the headstock from the back. You can see a picture of this style to the right. A few inexpensive tools will go a long way in making your experience more enjoyable. I would recommend them all as most are relatively easy to find. 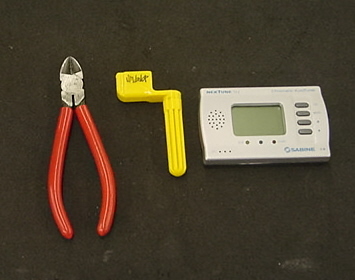 The peg winder and tuner can be found at most music stores. You may already have the other items. If you have never attempted restringing your guitar, I would suggest replacing only one string at a time. It’s much easier to get confused if you have six strings dangling around loose. I would also recommend tuning the guitar before you start. By tuning it first, you will have a better chance of getting the new string back in tune with the others. You will give up the option of cleaning the fretboard by replacing only one string at a time, but that will be a small price to pay for your first successful string change. After you have replaced the strings several times using this method and are more experienced, you might try removing the top three strings together and replacing them. This way, you can clean one side of the fretboard while the three strings are off, replace them and clean the other side as you replace the the bottom three. After changing the strings a few more times, you should be able to successfully replace all of them at once. 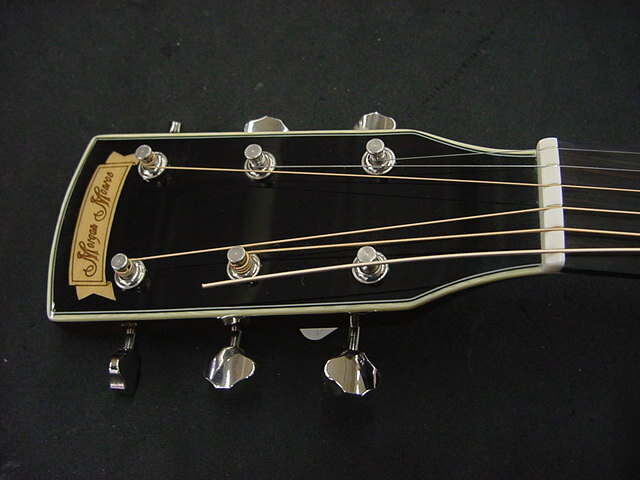 You can change the strings one at a time from the top down or bottom up. I’ll explain the process starting from the top (or bass string) and going down. The method described here will be for right-handed people. If you’re left-handed, replace “right” with “left” when the instructions involves your hands. Lay a thick towel or clean throw rug (preferably a new one if it’s going on the kitchen table) on your work area. Lay the guitar down on its back on the protective material with the headstock to your left if you’re right-handed, to the right if you’re left-handed. Use the peg winder and slowly loosen the top bass string, which is the one closest to you. Turn the peg winder slowly to make sure you are loosening the string instead of tightening it. It’s a good ideal to pluck the string and listen to its pitch as you turn the peg winder. If it sounds like it’s raising in pitch, you need to stop and turn the peg winder in the opposite direction. Next, remove the old string from the string shaft and pull out the bridge pin which secures the string to the bridge. 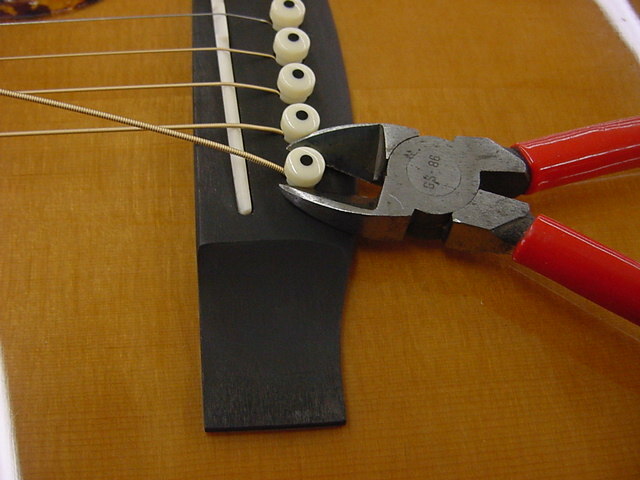 Your string winder may have a notch cut in the head for removing bridge pins. Occasionally you will have a bridge pin that is hard to remove. If the peg winder can’t pull the pin out, use your side cutters to gently grip the pin under the head and pry it out. Use your fingers under the cutters for leverage and to prevent the cutters from damaging the top of your guitar. This is easier than using regular pliers which will damage the head of the bridge pin. Discard the old string and remove the correct string from the new pack. I nearly always bend a small curve in new strings at the ball end. 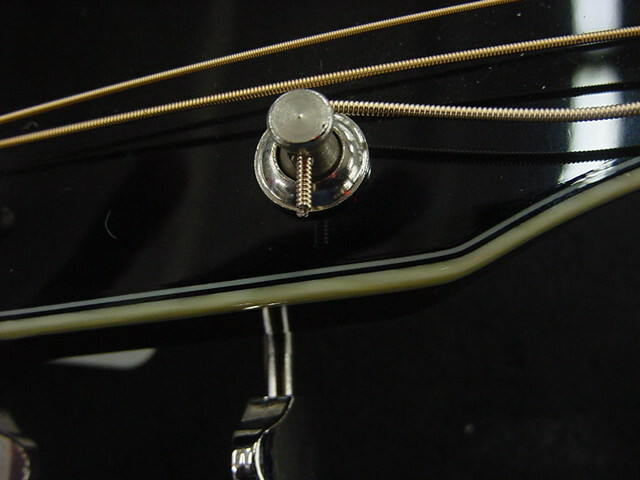 This is done to keep the ball from catching under the bottom point of the bridge pin, lifting or popping the pin out while tightening the string when tuning it. 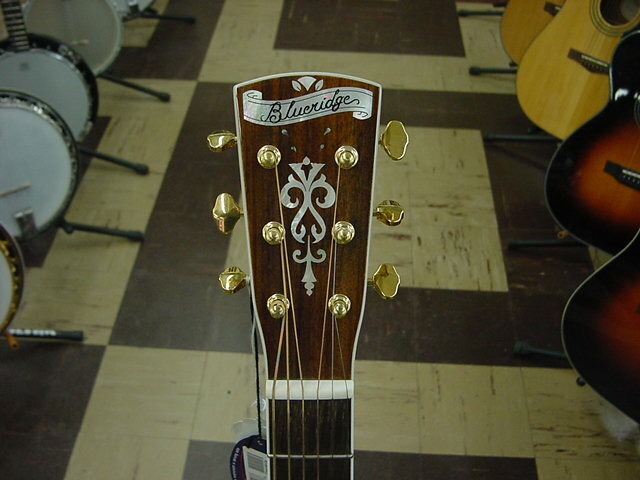 Place the ball end of the string into the bridge pin hole about one inch, keeping the curve pointing toward the neck of the guitar. 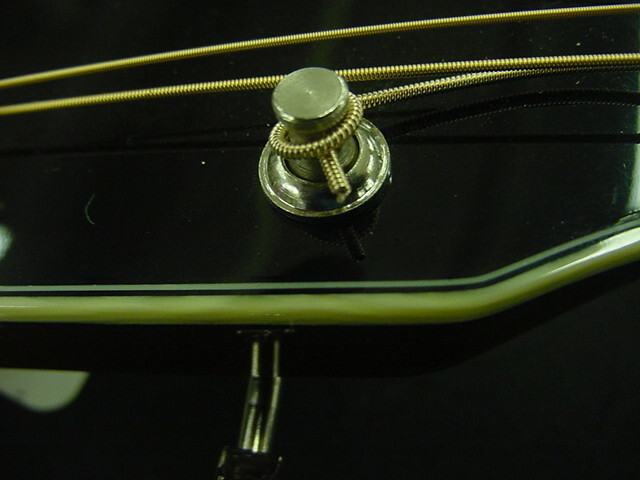 Install the bridge pin with the its grove toward the string and push it in while you pull up on the string. Pulling up on the string will cause the ball to pull up tight against the bottom of the bridge, preventing it from slipping up on its own as you tune the guitar. You should then pull the string up loosely toward the headstock and cut the string about 2 inches past the string shaft that it fits into. 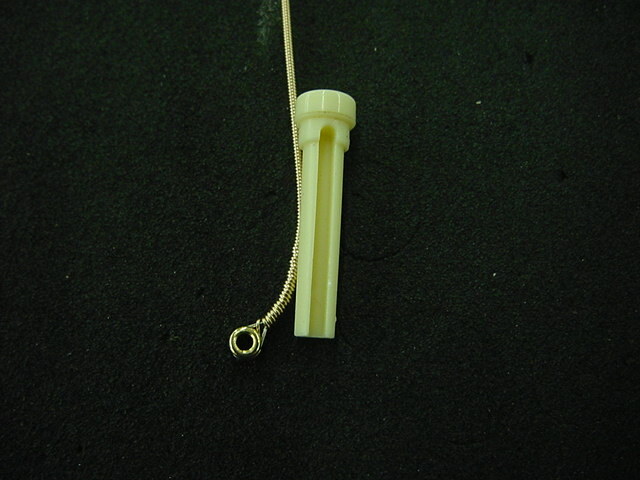 This will give you the extra length you need for the string to wrap around the shaft 3 or 4 times. If you cut the string too long, it may cause the string to overlap on itself, compressing over time and thus causing the string to go flat. If you cut it too short, there won’t be enough winding on the string shaft to prevent the string from slipping, having the same effect as being too long. Leaving excess string length on the end of strings while re-stringing or afterwards could possibly lead to eye injury! I’ve had long string ends slap me in the face, stick me and even slip under my glasses to hit me in the eyes. I now cut strings as soon as possible. I won’t even inspect a customers guitar in such conditions until I have first cut the excess string ends. Coiled string ends are just as dangerous. You never know when one may suddenly slip and uncoil on you. After you have cut the string to the correct length, push the end of it through the hole of the string shaft, leaving about 1/4 inch sticking out the opposite side. Bending the string in the direction you will be wrapping it on the peg shaft will help keep it from coming out of the hole as you tighten it. Use your peg winder to turn the peg button while keeping tension on the string, making sure you are turning the peg winder in the correct direction. 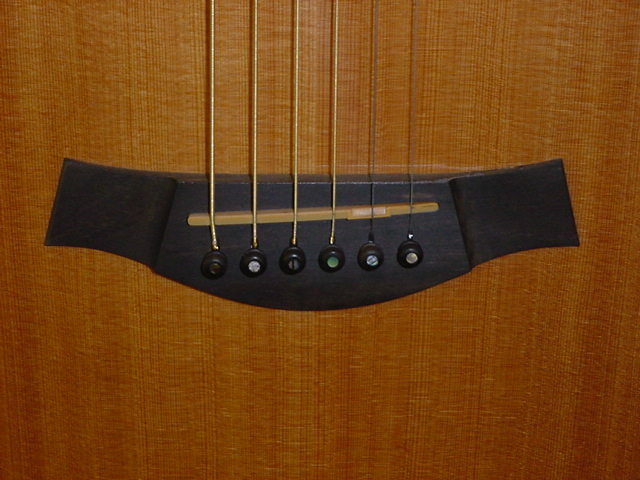 On most steel string guitars the string should wrap around the string shaft so that it leaves the shaft away from the peg winder. This will leave all of the strings going toward the center of the peg head as they go toward the nut. Let the first wrap go over the top of the little extra string sticking out of the other side. Bring the wrapping under the extra 1/4 inch the next time. This will pinch the 1/4 inch end and help it from pulling out of the shaft hole. Continue turning the peg winder while keeping tension on the string and let the string continue wrapping downwards toward the base of the string shaft. 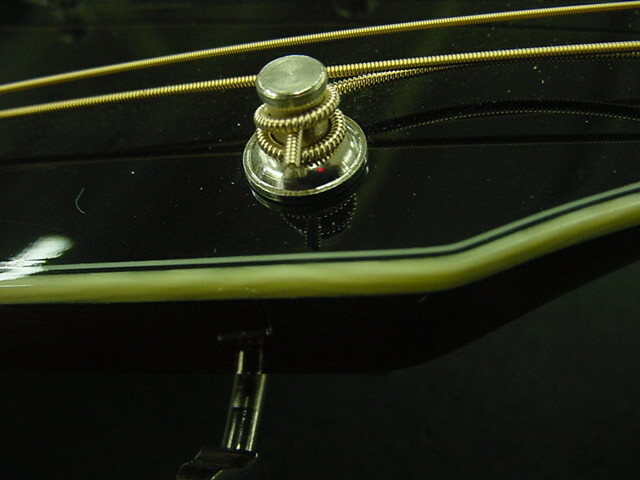 Tighten the string until it is not loose and use your electronic tuner to correctly tune it to pitch. Play the other strings if you get confused as to whether you have tuned too high or not. The bigger the string, the lower its pitch should be in relation to the others. Replace all of the strings one at a time until you have put the complete set on. The only difference will be the 1st and 2nd plain strings. Being without any wrapping, they will be slicker and more apt to pull out of the string shaft hole. I always cut these two strings about 1 inch longer and bend the short end over after it goes through the string shaft hole. I hope this helps those who have not tried re-stringing their guitars. 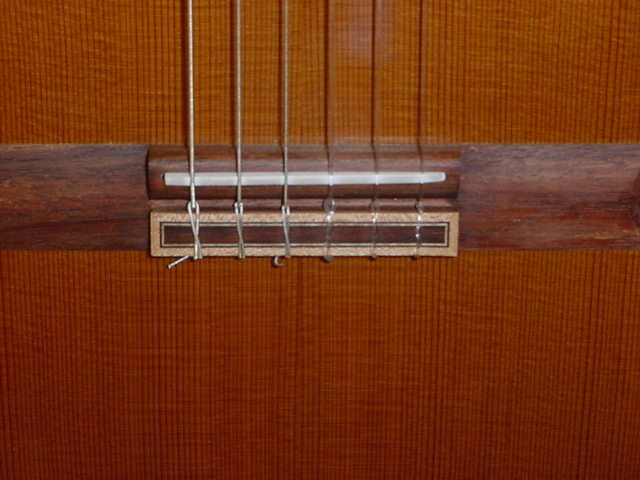 The folk guitar is different in that the string shafts go through the slot cut into the peg head instead of sticking out of the top. Classical guitars are all together different and will be the subject of another topic. This entry was posted on May 5, 2010 at 6:49 pm and is filed under MUSICAL INSTRUMENTS....	You can follow any responses to this entry through the RSS 2.0 feed. Both comments and pings are currently closed.